Let see how to use Performance mode galaxy S9 and galaxy S9 plus. Battery draining is one of the most common issues on all smart phones. Using this Samsung galaxy S9 and galaxy S9 plus high performance mode, you can improve battery life on your devices. This Samsung S9 performance mode is helpful to show highest quality display with maximum brightness and screen resolution. You can quickly access Samsung galaxy S9 performance mode settings from quick settings notification panel in your device. 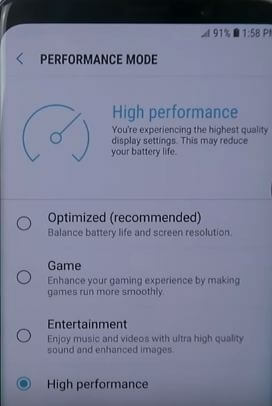 In galaxy S9 and galaxy S9 plus performance mode settings, you can choose from optimized/Game/Entertainment/High performance. Follow below given complete process to see how works performance mode galaxy S9 and galaxy S9 plus devices. You can see high performance mode screen with Increase brightness and screen resolution settings. Now set screen resolution of your display. Not all apps supported all screen resolutions. 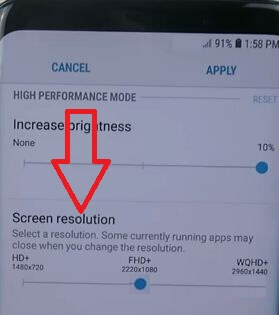 You can see below given four options for adjust screen resolution settings on Samsung S9 and S9 plus. By default set this. It will balance battery life and screen resolution in your S9. Enhance your gaming experience by making game run more smoothly on your galaxy S9 & S9 plus. Enjoy music and video on galaxy S9 & S9 plus with ultra high quality sound and enhanced images. Highest quality display resolution settings and also helpful to extend battery life and speed up galaxy S9 and galaxy S9 plus Oreo. 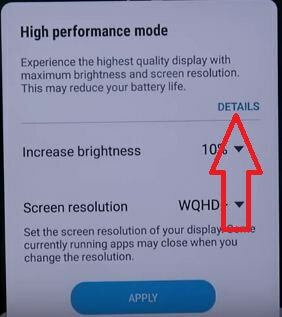 Now Samsung S9 high performance mode is working in your device. You can change performance mode settings whenever you want using above settings. And that’s all about Performance mode galaxy S9 and galaxy S9 plus Oreo. Did you find above tutorial helpful? Let us know in below comment box. Don’t forget to share with others, if you found it helpful. Stay and connected with us for latest S9 and S9 Plus tips.